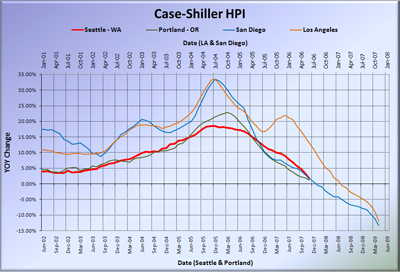 Home prices in Seattle continued their slide in November, according to the latest data from the Case-Shiller Home Price Index. Down 1.43% October to November. That’s the fourth month-to-month decline in a row, and a year-to-year increase of barely more than half of October’s already paltry 3.30%. Here’s the usual graph, with L.A. & San Diego offset from Seattle & Portland by 17 months. I had to re-align the vertical axis, since San Diego is now seeing nearly -15% year-to-year declines. Ouch. 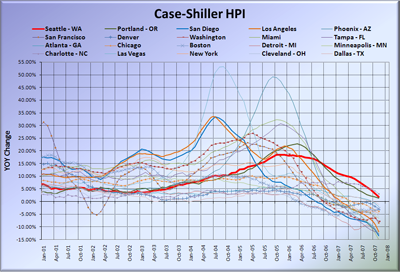 And yet again, here’s all twenty cities tracked by Case-Shiller, with no time-shifting. Yowzers. It looks like a race to the bottom. But don’t pay attention to all that “doom and gloom” data. Just follow your gut and jump right into an enormous loan on a depreciating asset. You know you want to. Well, if I would take the governor’s advice that’s exactly what I should do. Go out and buy, buy, buy! Everything is fine! Move along! you know, i do want to. only i can’t get a 110% no-doc subprime loan anymore. really, though. if a bank were willing to give you a loan for 110% of a house value today. what good reason would you have to not take the loan, never make a payment, pocket the 10%, and live rent free until you get physically removed. on a $500k house, you make $50k. how much are your credit rating and sense of morality worth to you? is it really so easy as they make it sound? does the lender really have no access to the borrower’s other assets? unrelatedly, how many dogs does The Tim have? I think I see a trend. What is really sad (or laughable, depending on your mood) is that there are still some people in the real estate industry who believe the market will “boom” this spring. I have first-hand knowledge that this is indeed a fact. It’s worth noticing that YoY and MoM are very similar indicating that the current downward pace is making up almost all the YoY decline. That will change comes spring since the spring months last year recorded about 1-2% appreciation per month. So, if we just keep the current MoM downward pace we will see some pretty substantial negative YoY numbers (double digit ) comes summer. Foreclosures are up 26% YOY in King County. >> is it really so easy as they make it sound? does the lender really have no access to the borrower’s other assets? Homestead exemption is 125k. So if you fully own a cheap house (house < 125k), then they really can’t touch you! They’ll take every last one of your socks and underwears, and your cars, and possibly your computer so you can’t post here except from a rented one – but they’ll leave your house. alex, i guess i was unclear. in Wa state, if i walk away from a house loan and the bank can’t recover the principal of the loan by selling the house, can the lender go after my other assets? if this is the case, what reason was there to not get a 110% loan on a $500k house, pocket the $50k, and leave the house to the bank? Could you post a graph of HPI (rather than a graph of YOY HPI)? A quick glance at this graph and people might mistakenly think that the Nov 2007 HPI is below the Nov 2002 HPI, but of course this graph says no such thing. This graph says that prices now are much higher than 2002. People need to mentally integrate the area under the curve in order to see price changes, which is hard to do visually. That’s why a graph of HPI would be very useful. I graphed the CS – tiers, if you are interested, Tim. I just don’t have an internet presence to post them anymore. I could fiddle with my comcast account I suppose. Just in case we do get to zero percent interest rates, and we do see the 15-20% depreciation in home prices here we are likely to see…..
Is there any way I can take more than $10K out of my 401k to use towards a down payment???? Just wondering as I have seen that number thrown around as a maximum amount one can withdrawl without penalty and it’s pretty much peanuts in this market even given some loans a first time buyer can get with an 800 credit score. Supposing that portion of the bill becomes law, would you expect it to impact the Seattle housing market? I see it as a possibility that more access to credit could lead to a price increase, but I’m really not sure one way or another. It could well be that the market is slumping enough that it won’t matter at all. Runs w/ Scissors: I think you can take a loan out against your 401K if it will go towards your first home. I’m not so sure on the details yet, I’m looking into this myself. Maybe someone else can elaborate? Generally speaking, and much to many people’s surprise, a bank can go after a borrower for a deficiency where the foreclosure sale brings an amount less than the amount owed, BUT, only if they conduct a “judicial” foreclosure rather than the cheaper, faster, much more common “non-judicial” foreclosure. As the names suggest, the former requires a lawsuit in superior court and the latter does not (thus, the former takes considerably longer and costs much more). Most lenders skip the deficiency, go with the speedy non-foreclosure trustee’s sale, and write off the loss. But, the lender doesn’t have to and occasionally won’t if they have reason to believe the borrower is solvent and worth pursuing. I rarely have this issue come up but I’ve three different people in the last two days of contacted me about related issues (not counting this post). So, my anecdotal experience seems to support the notion that the default/foreclosure rate is rising. I’ve also turned away a lot of callers searching for an attorney who will stop their foreclosure or renegotiate their loan. That’s tedious work and not something I’m interested in doing. As for the homestead exemption, I can’t recall off hand with absolute certainty, but I’m 51% sure a purchase money mortgage lender on a primary residence is not limited by the homestead exemption and can go after the borrower for the deficiency (again though, only if they proceed judicially). You also have to remember that banks are not giving money away in the form of those “liar” loans that were a major part in contributing to the bubble. Most people will still need to be making a nice salary, have payment-to-gross income be 28% or lower and debt-to-income be 38% or lower. Also, let’s not forget the required 20% down payment, which is 80K on a 400K house. Then if the buyers are purchasing contingent on their home selling, that can throw a wrench into things. At the end of the day, if the bank doesn’t approve the loan, you can price the house whatever you want to, but it still won’t sell if people can’t qualify. It’s my understanding that the IRS allows you to withdraw $10,000 as a downpayment toward a house if you are a first-time buyer. So it’s not a loan but a withdrawal and you won’t be taxed on the amount up to $10,000. You could withdraw more than that, but you will have to pay taxes on it as previously you did not. Right someone else? (It can be easily researched at the IRS website. Plans differ, but it’s fairly common to allow *loans* from 401Ks. This is separate to the $10K *withdrawal*, which is something I’m not familiar with. -Maximum of $50K or 50% of your 401K balance, whichever is lower. -If you lose/leave your job you pay back the loan immediately, or it’s treated as a withdrawal and you’ll pay the penalty (10%) and income tax. Not good. -You pay interest (PRIME+x%) but the interest is paid to you, by you. Most people say “don’t do it” and I can see why, but if you go into it with your eyes open then it can be a good option. This is not the case, even today. You can still quite easily top up an 80% LTV with a 10% HELOC, or even 15% HELOC if you’re willing to pay the interest premium. Of course, you need W2s, bank statements, etc. No liar loans, and no (little) subprime either. 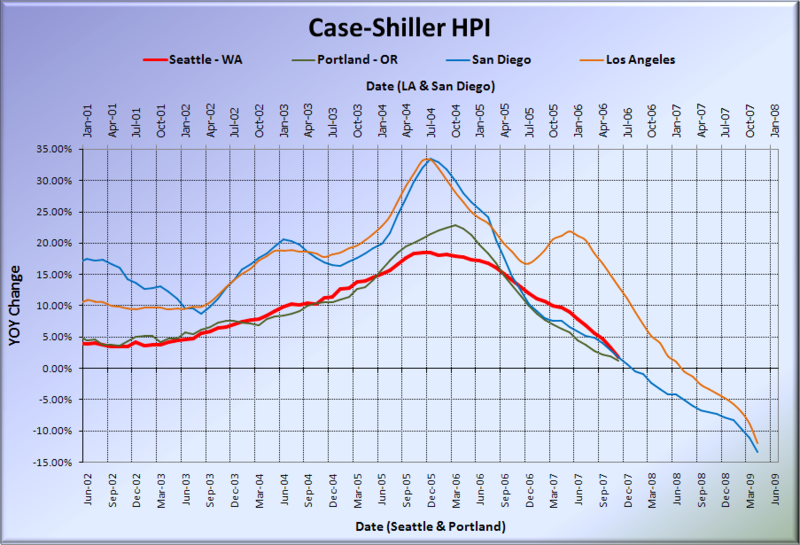 The Case-Shiller HPI for November will probably seem cheery compared to Q1 08 results this spring. Just browsing the news tonight and headlines say that the FBI is focusing on 14 companies in a mortgage probe; home prices fell record 2.1% in November; and stocks ended solidly higher, fueled by further rate-cut expectations. Just plain weird. It would be interesting to see a visual comparison of the dollar value of comparative median price movements in the 20 markets over the same period as well as the YOY percentage changes just to see how much price debt is still hanging in the zero gravity arc right now. Considering that the median home price differ between markets, the overhang of actual price debt may be something to see, even if some YOY changes are more pronounced than others. Don’t take money out of your 401k. You can take $10k out of IRA money towards the purchase price of a home tax free. You get the appreciation tax free. Oh, if you are married, your spouse can use $10k in IRA money as well towards the purchase price of a first home. That’s $20k tax free that can be removed from IRA’s w/o issue. Tim – Since you do a time shift forward (on a horizontal basis) for Seattle you should also do one on a percenage gain (vertical basis). The homestead exemption protects your ownership of your home from creditors holding debt not secured by the home, i.e. credit card debt, business debts, etc. This is 100% opposite to the question that the OP was asking, which is whether the holder of a mortgage loan can go after your other assets if the value of your house is insufficient to cover it. Of course it’s a given that they get the house. In response to your question about why are stocks going up while everything else seems to be going in the toilet, I can explain. What you are seeing right now in the stock market is what is commonly known as a “suckers rally” or “dead cat bounce”. This type of rally is historically consistent with every recession the US has ever had from 1929 to current. You always see it right before a bear market and/or recession sets in. If you check you will find that the actual volume of trading is very low right now compared to the increase in valuations of stocks. What that means is only a few suckers are buying and the smart money is already out. Thanks for some of the responses on the 401k/IRA withdrawl for a down payment…. So the bonus question is that if you have both a 401k and an IRA, could you take $10K out of EACH sans tax penalty to use as a down payment? I’ve been seeing a lot of homes going contingent recently (i.e. the last 2 – 5 days), and it brought up a few questions in my mind. 1) Is there any way to track these? I’d be curious to see how many don’t sell since they have to wait on another sale..
2) Do these homes show up in the inventory numbers or not? You are actually wrong on the 401k. Each person (so 2 of you if married) can take $10,000 out of your 401k for a down payment on the house. It is taxed! I just got the IRS documents last night regarding the withdrawl and in big number sint eh form the “taxable” anount is $10,000 for each person (I actually onyl have mine – I imagine my wife’s is coming). The benefit is not penalized the standard 10% penalty for ealry withdrawls though – that is where you win with this deal. Any other type of withdrawl you pay at least 10% on top as a penalty. Also – you can’t wait until you file to pay the tax – then you dinged with late payment penalties. You have to pay it off during the year you withdrew it as estimated tax payments. Otherwise you can have a large late payment penalty. If I am wrong I am wrong – let me know where. That is how it goes as far as I understand it at this point. In case I wasn’t clear, what I’m saying is that a “holder of a mortgage loan” can, and almost always will, go after the borrower’s other assets if the foreclosure of the house does not bring in enough to satisfy the mortgage debt, unpaid interest, attorney’s fees, court costs, and costs of sale. This is because a “mortgage” as opposed to a “deed of trust” must be foreclosed judicially. A deed of trust, on the other hand, gives the note holder the option of judicially foreclosing (and seeking a deficiency judgment enforceable against the debtor’s other assets) or proceeding non-judicially (thereby giving up the right to pursue a deficiency judgment and the option of executing against the debtor’s other assets). Please help me understand “homestead exemption” better. That limit protects you against debt not secured by that particular home, right? So here’s an example I claim correct [and please comment]: if you own two homes (say A and B), and you let A be foreclosed, the bank can go after your assets, including any equity you have in B. But they have to leave you with 125k worth of equity in B. So if B is worth 125k or less, and it is paid off, you are sure to keep B. This link says the homestead exemption is $125k only if you purchased in the last 1215 days. If not, it’s only $40k. If you follow the link that leads off Tim’s post–thanks again for the numbers and link, btw–you can get the CSI numbers from that page and play around with them to your heart’s content. Here is an interactive tool to view Case shiller data on both an absolute and relative basis from the Paper Economy site. The homestead exemption is not a simple matter and I’m reluctant to comment on its operation in an open forum such as this. Accordingly, I won’t comment on the accuracy of the analysis of the homestead exemption contained in the link you posted. I did look up the effective date of the amendment raising the exemption amount to $125k (from $40k) – July 22, 2007. So I imagine every homestead property bought after that date is protected “up to” that amount. I don’t have time to research whether homesteads bought before that date do or do not enjoy the same protection, but it would seem unfair to me if they did not enjoy the dame protection simply because of the date they bought the property, at least in a general sense, i.e., an ordinary judgment creditor going after a debtor whose only asset is his/her home. The website you link to discusses the homestead exemption in the context of bankruptcy law which is federal and often has a way of manhandling well intentioned state laws. Also note that per statute, if the “net value” of your home is less than $125k, you’re only protected up to that amount. Per RCW 6.13.010, the term “net value” means market value less all liens and encumbrances senior to the judgment being executed upon and not including the judgment being executed upon. The RCW chapter on homestead exemption is available here for anyone interested: http://apps.leg.wa.gov/RCW/default.aspx?cite=6.13. You’re the lawyer. I’m goin’ with you on this one. Your hypothetical seems to presuppose that Home B is the one claimed as the homestead. In that case your conclusion sounds about right, however, the home need not be paid off. For example, if your home is worth $500k and your only debt on house B is $375k (not including the deficiency on A), your net value is 125K. In this case, house B should also be safe from execution (see the definition of net value above). The deflation in Seattle (the red squares) from its peak in Jul-07 is tracking at about the same rate as Miami from its peak in Dec-06. 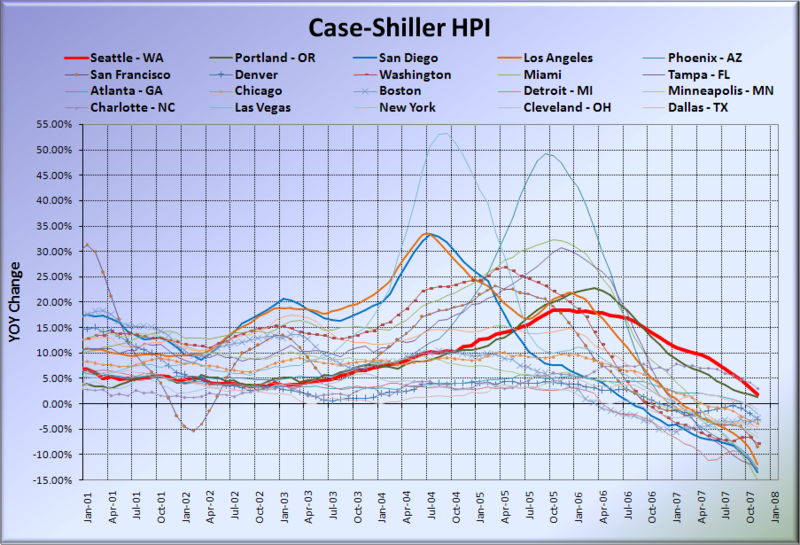 The deflation in Seattle is one of the fastest rates of decline compared with all of the other cities in the CSI. Once I figured what what on earth was going on in that chart, it was pretty interesting. I think we have to be careful with this comparison with Miami. Our initial decline was due to two factors: market situation, credit crunch. Most other cities started their decline without the credit crunch. Therefore, I think it’s reasonable to guess that our initial decline is steeper than it would have been without the credit crunch in place. That’s not to say that it wouldn’t have gone down without the credit crunch (aka “return to reality for borrowers”), but that we might have taken longer to start the decline, and it might have been less stark. In locations with a seattle zip the sales volume is not back, but those houses that are selling (without some flaw that prohibits any bank loan) are going for normal prices in my neighborhood (Maple Leaf). A friend just sold his house in less than 30 days fo their asking price that required a jumbo in the Greenlake area. He got slightly less (~1%) than his most bullish estimates from early June I had scoffed at.